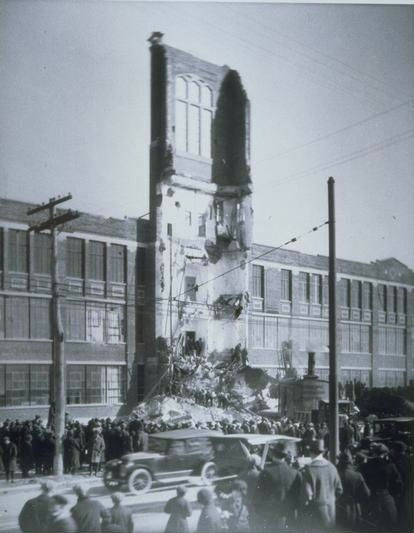 On March 31, 1923, a 56,000-gallon water tank dropped through 4 concrete floors of the Fuller Brush Company Tower, which was in the final stages of construction. Nearing completion, the 160-foot-high, 4-story tower formed the entrance and elevator shaft of the new plant on Windsor Avenue in Hartford. The collapse occurred at 11:40 a.m. when the 200-ton water supply tank for the factory’s sprinkler system, located on the upper 2 stories, failed taking out the south and west walls, as well as the lower half of the north wall. Nine victims were pulled away from the wreckage before the firemen ordered everyone back from the building. Gas had filled the area from damaged lines, and the roof of the tower remained almost entirely intact leaving a large portion of it swinging back and forth dangerously in the wind. The roof needed to come down before further rescue attempts could be made. The Connecticut Company, Hartford’s electric street railway, offered assistance. Crews attached heavy cables to two trolleys in an effort to bring the roof and remaining brick work down but failed in their attempts. Eventually dynamite was used and rescue and recovery efforts continued through the night despite freezing temperatures and a 30-foot pile of debris.